We are one of the leading Suppliers of Moisture Measurement Meter. Flush mount, digital, microwave Moisture Measurement Meter is accurately designed following the set industrial parameters. 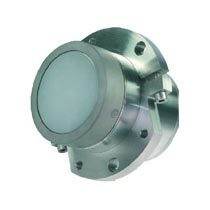 The Hydro-Mix VII is a rugged, microwave Moisture Measurement Meter designed to be installed flush with the floor of a mixer, chute or conveyor in process control environments. Reading at 25 times per second and combined with on-board functionality such as signal processing, smoothing and averaging, the Hydro-Mix VII Moisture Measurement Meter accurately measures the moisture content of material as it passes over the ceramic faceplate. Remote configuration, calibration, diagnostics and firmware upgrades are simple using Hydronix Hydro-Com software. The linear output allows direct integration with any control system using industry standard interfaces. Digital technology provides precise linear moisture measurement. Advanced Digital Signal Processing provides a clear signal with rapid response. Two analogue outputs, digital RS485 communications and configurable digital input/outputs. Remote communication with Hydro-Com software allows configuration of all sensor parameters including selection of sensor outputs, graphic traces of outputs, calibration of sensor readings and firmware upgrades. Discrete inputs : The batch average start and stop or moisture/temperature multiplexing functions can be controlled via the digital inputs, Refer to 'Connecting the Cable' section of the manual for more information. Freight : Extra by courier on to pay basis.